A few weeks ago, Jason Leach wrote a blog post where he said that clearing the snow from sidewalks should be seen as important as clearing snow from roadways. This is a massive public safety nightmare potentially facing the city. Someone is going to get killed or seriously injured. Dundurn Street already has crazy narrow sidewalks between King and Main, and now half the sidewalk is filled with the snowbank from the road. I agree with Jason: this is a critical, and often-neglected issue, whenever there is a major snowstorm. 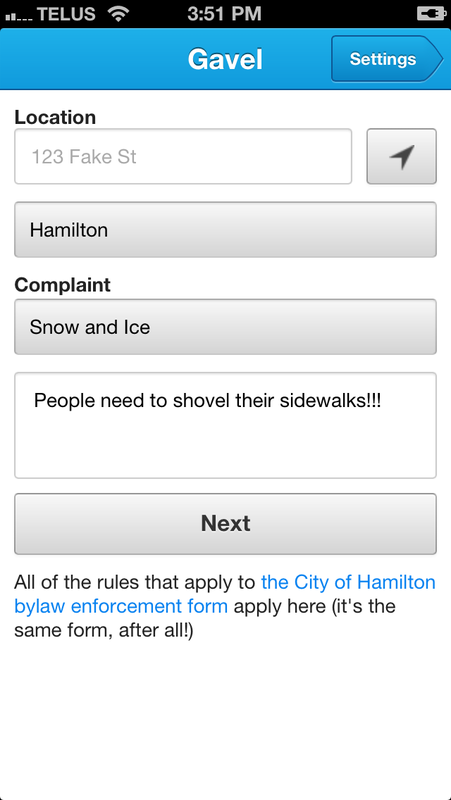 Fortunately, the City of Hamilton has an online complaint form you can use to submit a complaint when sidewalks aren't cleared within 24 hours of snowfall. And fortunately, the City's bylaw complaint department is fast and responsive - they just need help finding the issues that we're experiencing. Unfortunately, the City's form doesn't remember your personal information, so it takes a long time to fill out each time. And it doesn't work well on mobile devices, either. That's why I created Gavel, a mobile-optimized version of the complaint form that lets you save your information (in local storage on your device - no personal information is collected by me in the app) and easily submit it to the City's website. Gavel isn't quite ready for prime-time: it doesn't work on Android devices at the moment, just on iOS devices. It's also not entirely rock solid and does suffer from a few issues from time to time. But with a snowfall this big, I just couldn't keep holding onto it. Besides, it's open source, written in Ruby using Sinatra. Get it working on Android and submit a pull request and I'll update the app right away! Please let me know if you experience issues in the comments and I'll see what I can do to get it fixed up. I hope you enjoy it, and I hope it makes the City safer for pedestrians. I hope someone complains about the sidewalk in front of my house, where the city snow plow came around and filled in the sidewalk I had already cleared. I'll tell the city where they can put their ticket. I tell you exactly who needs to get hit with some stiff fines for this crap. The parking lots in the city! So many of them are plowed but have unplowed sidewalks. Why would anyone downvote that comment? The very odd RTH commenter will downvote comments out of sheer spite. If pedestrians really were the priority that City policies pretend, sidewalks would be plowed before roadways. I saw more people walking down the middle of our street yesterday than cars on it. Just walked own the king east near Emerald the cops should really clear the snow and ice in front of their storefront station. Adrian: what a splendid idea. Create the ability to save frequently used addresses and complaints, in order to permit one-click reporting of frequent litter/snow offenders. Great Tool.....Durand would post on its website. Lots of complaints in the Durand with snow plow operators putting snow back onto cleared sidewalks and corners in our downtown neighbourhoods that are not cleared creating a very dangerous situation to cross streets. With so many seniors and walkers in our downtown, one would think those bob cats would be out with the plows. Great idea - and well done. A side note: by Monday afternoon, the city-maintained stretches of Sterling were still not cleared. And Sterling ihas lots of pedestrian traffic - most of which was on the bike lanes on Monday. Who does the city fine in such a circumstance? This year the city contractors have been plowing snow from the road back on to cleared sidewalks all over our ward (6) I think they are doing it on purpose so that the city will start plowing sidewalks and this contactor will make more money doing that. and our property taxes will skyrocket. Don't just complain here, it does so little, call your councillor and tell them.......they won't do a thing unless they hear from lots of people.